Named after the discoverer Henry How, a geologist from Nova Scotia. Howlite is found in Canada (Nova Scotia, Newfoundland, New Brunswick), and the United States (California). 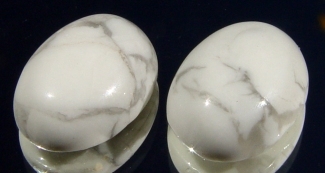 White, and normally found in an opaque massive form, although there are extremely rare crystals of howlite. Very similar to datolite in appearance. White howlite is not enhanced. Howlite can be dyed to imitate other stones such as turquoise, lapis lazuli and others.